After her debut in 1959, Barbie needed a place to live and hang her numerous hats and outfits. She also needed to store her accessories. So what's a girl to do? Buy a home, of course! In 1960, Babs got a house. Colorful and simply designed, it was a clear example of one of the principles of modern architecture: "Form follows function." It was made of card, and it folded up neatly into its own carrying case, handle included. One could put together the furniture that came standard with the home, and set it up in different ways. 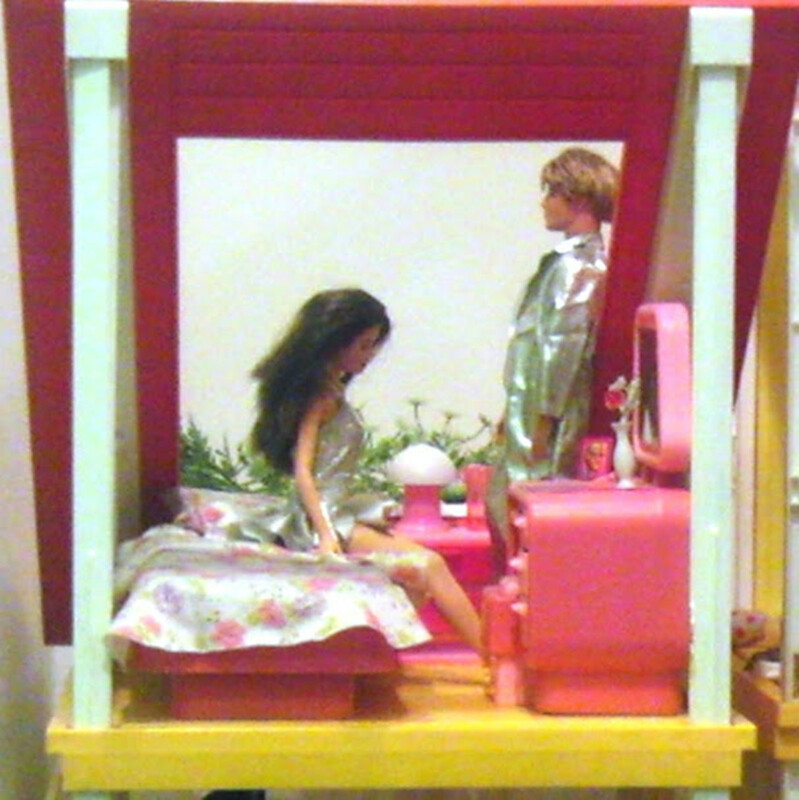 Outfitted with a closet and vanity, as well as lots of Scandinavian-style furniture including a bed, love seat and coffee table, chair and side table, record cabinet and more, it was a pretty good deal for a doll like Barbie. She had numerous places to sit (too bad her legs didn't bend! ), a bright and cheerful décor, and plenty of storage space. 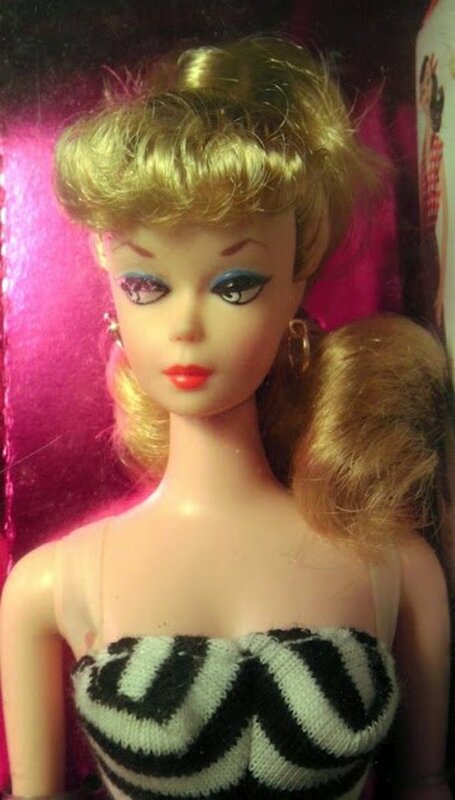 But always in search of the bigger, better deal, Barbie traded up in the early 60's. She went for House # 4092. This was a change from the original Dream House in several ways -- not only was it significantly bigger, but one could set up the house itself in different ways, not just the furniture inside. This house had plenty of built-ins, such as a closet, cupboard, range hood, and fireplace. 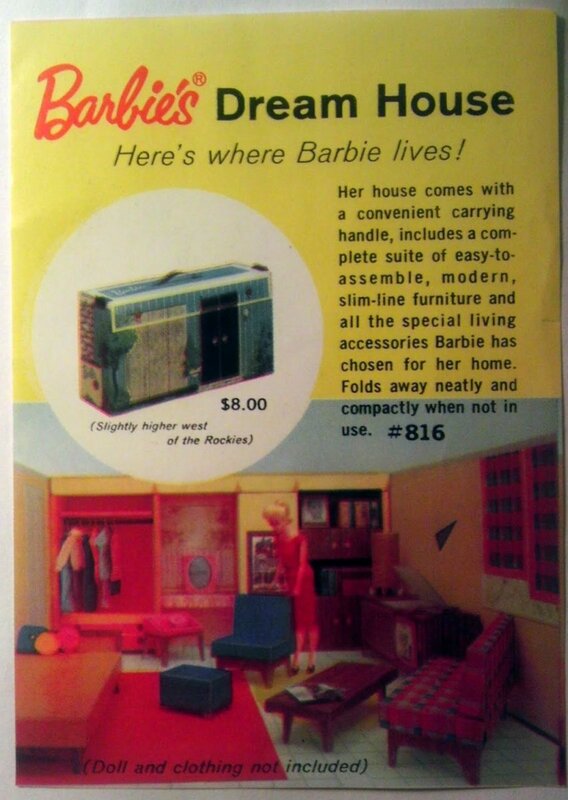 Furniture included a bed with nightstand, four chairs, a chaise lounge, a television with three reversible pictures (high-definition has nothing on Barbie!) and more. It also featured a sliding door and an authentic metal rod in the closet. Made of chipboard, this dream home could close up into a conveniently handled play set, in case young girls felt the need to bring everything to a friend's house or Grandma's. Personally, I really like this one, and would love to own it. There's something so "Frank Lloyd Wright" about the brick wall that I would enjoy it in my own home. The furniture styles may not match each other, and the colors are awfully bright, buy hey! It was the Sixties after all, and Barbie was right there in the swing of it. To the right is the same #4092 Dream House, supposedly "restyled." But they can't fool me. I can read, and this advertisement has the same words and picture as the other one. A different font is not a different house. Nice try, Mattel! By 1966, Mattel had switched to vinyl material for the houses as it was more durable than heavy card and could be cleaned. The Family House had molded plastic furniture, a real mirror, and lots more. It could also fold out for play and be re-bundled for travel. 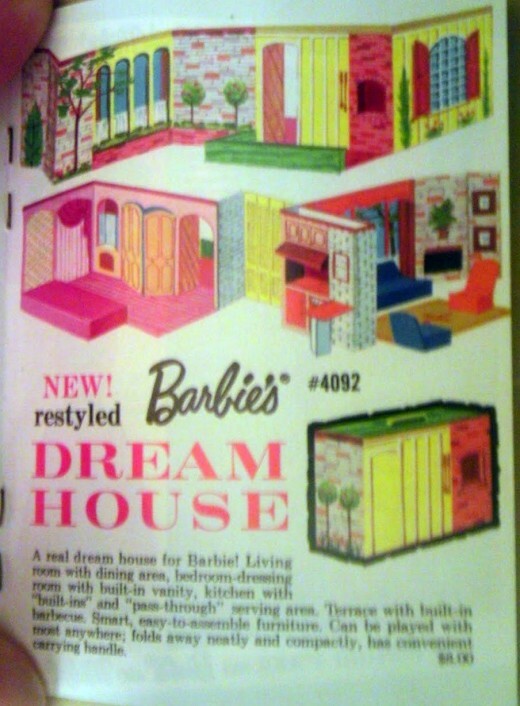 Dream Houses fell out of style for a while and were replaced by Barbie Townhouses. 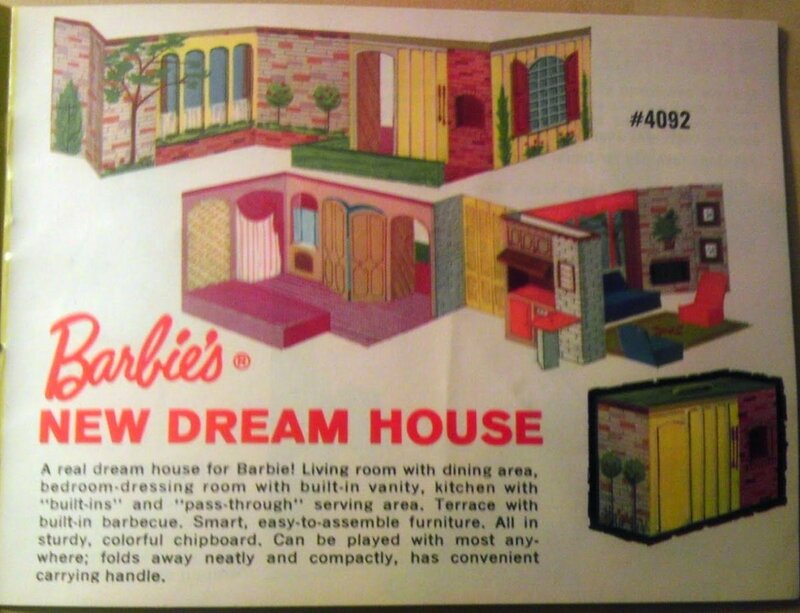 But by 1980, the Dream House was back and in a big way. Barbie turned 21 and got a two-story A-frame McMansion! From the outside, it looked to be modern-style and reminiscent of her beginnings in the sunny west. Certainly the colors were not traditional... yellow and white, with a rust-colored shingled roof, spoke to Northerners (I grew up in NY) as being the absolute essence of California -- whether or not it was true. This home was of very solid plastic, and "parents had to put it together." Open air skylights, a closet, a small deck, lots and lots of windows in a faux-jalousie style, two sets of swinging doors and a double door at the main entrance offered a plethora of play opportunities. Later versions were pink and white, but in my opinion the yellow and white one had much more style. The house could be split into three parts and be set up in different ways, much like its predecessors, and it also came with a great deal of sturdy pink plastic furniture. By the 1990s Dream Houses were equipped with elevators, doorbells, flushing toilets, sizzling stoves, and other electronic goodies. But in 2009, Jonathan Adler changed the whole game. He created a 3,500 square-foot life-sized Dream House to celebrate Barbie's 50th birthday. Garishly colored and over-the-top (ostrich feather furniture, anyone? ), this creation is still lots of fun and plenty tongue-in-cheek. Mattel continues to improve the Dream House, and stay relevant. In 2011, they teamed with the respected AIA (American Institute of Architects) to challenge architects to create a home for the newest dream doll at the time, Architect Barbie. Although the winning design will not be manufactured by Mattel, donations were made in the designers’ names to CHAD, a charter high school in Philadelphia that emphasizes architecture and design. It seemed that Barbie would never leave Malibu. But in February of 2013, Mattel dropped a bombshell... Barbie would be leaving the area (it was a seller's market, after all) and moving to a new location! The Malibu Dream House would be discontinued with a new advertising campaign preparing to be kicked off in the fall of 2013. Despite still being the #1 doll fashion doll worldwide, sales of the beauty fell three fiscal quarters in a row during 2012. What better time to turn the beat around? A faux home listing was placed in Trulia describing the sale of Barbie's "pinktastic" home with the sale price at a cool $25 million. The "crystal" chandeliers and self-flushing toilet are worth at least half that on their own, don't you think? 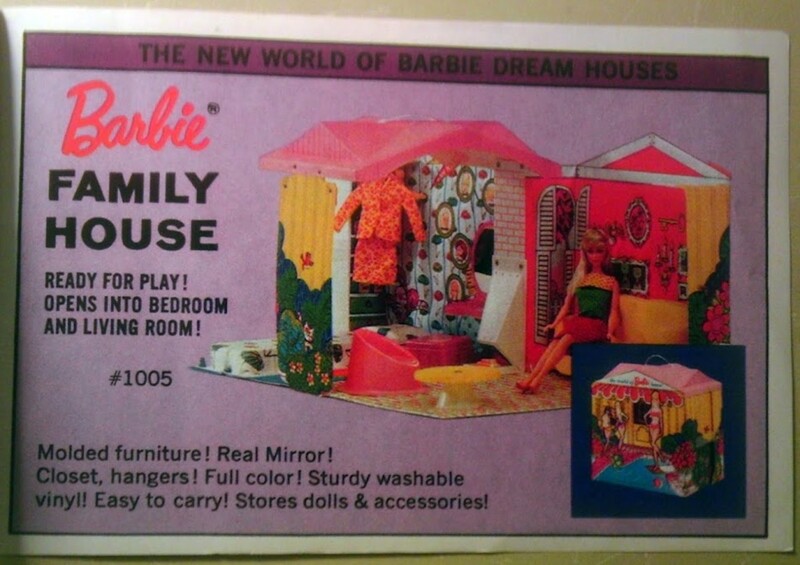 Did you or someone in your family own a Barbie Dream House? Yes, and we still have it! Yes, we eventually gave it away. Sort of. We made our own Dream House! Certainly not. A house for a doll? That’s consumerism at its worst. But where would Barbie be moving, and what type of home would she be living in? This information has yet to be disclosed, but Mattel brought four designers on board to figure it out: Jonathan Adler (remember his real-life 3,500 s.f. Dream House in 2009? ), Lulu de Kwiatkowski, Celerie Kemble and Trina Turk. And guess what! Fans will be able to put in their two cents' worth to help determine where Barbie will lay down roots next. So what do you think? Is a home for Barbie too much? Or just the right amount? 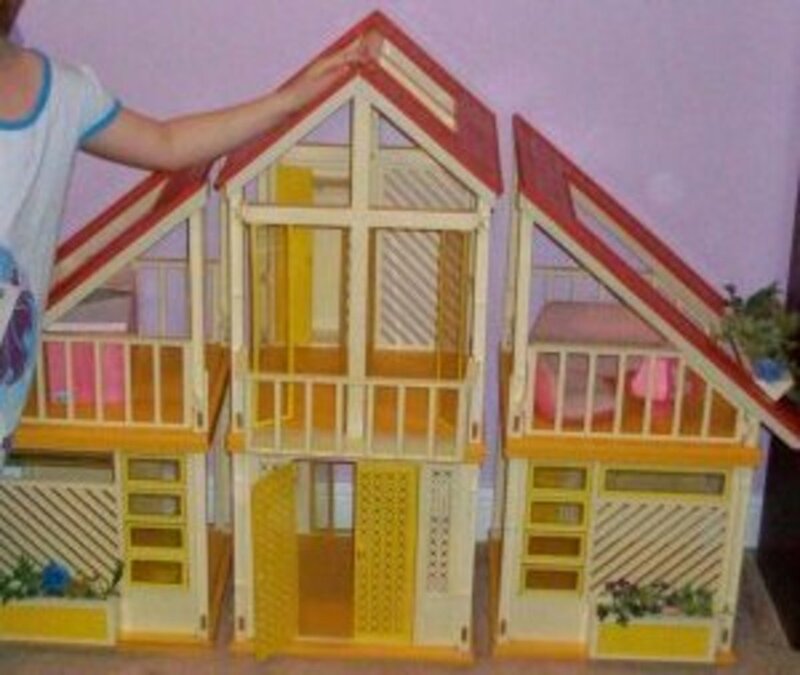 Fun to read the different kinds of Barbie houses over the years. I had one of the versions in vinyl that opened up to a groovy dining room, bedroom and livingroom. Made around '69 or '70. 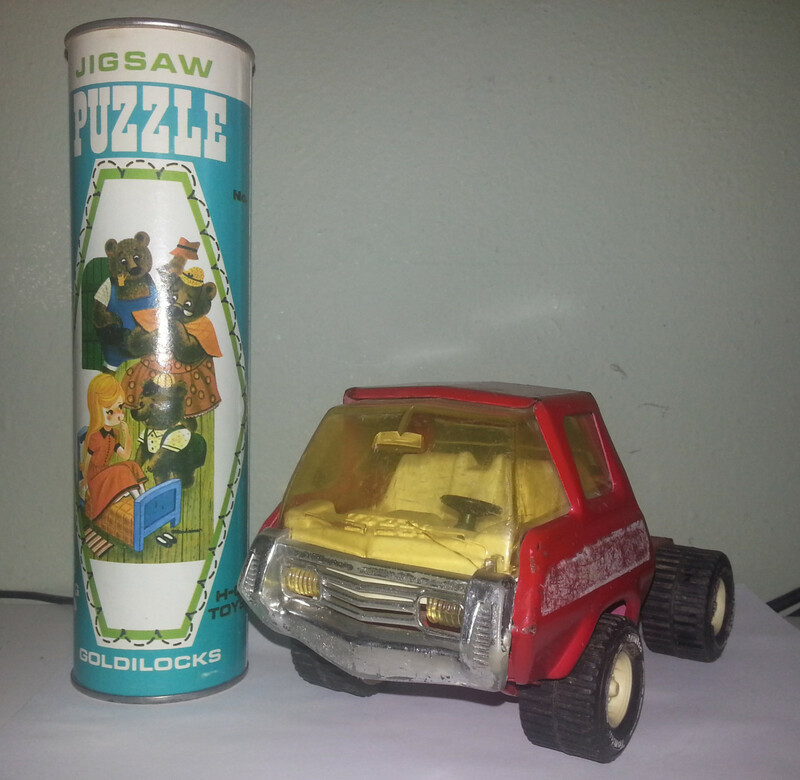 I have that stored somewhere, along with a Barbie pop out tent. 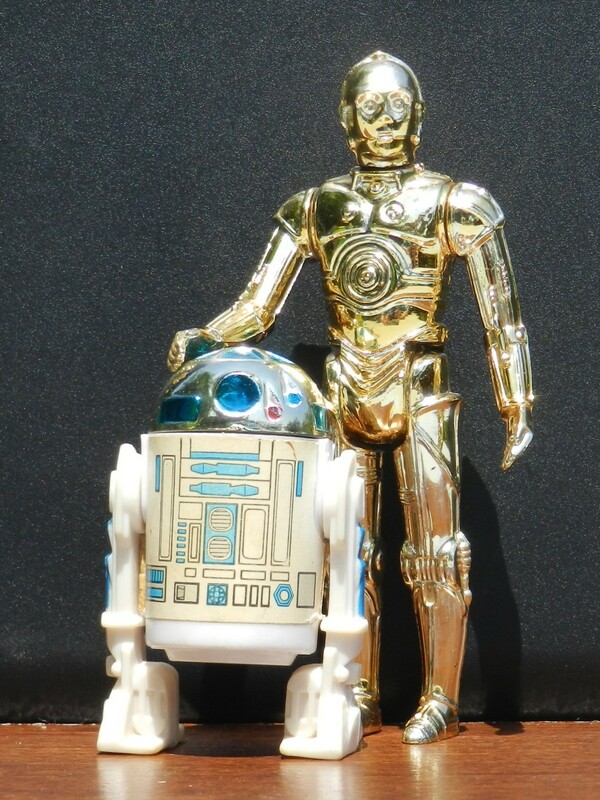 In fact, I just wrote a hub on my childhood toys so I'd love it if you dropped over to take a peek. (I'm fairly new to Hubpages) This was so fun, voted up! Sure sure no problem it is really my petname used by my parents, relatives & friends. Take care. Thanks do much for stopping by! I totally enjoy your comments! And how sweet of you to donate. I bet those kids had a good time with them. Once again an enrapturing hub from your Barbie hub series! Though I don't have a Barbie dream house, I had Barbie bath-tub and Barbie's whole kitchen and I had complete fun with them! As I grew up, I donated them to the local school for the disabled. Just oh too much. Loved it. I love, love, love this hub! Thanks for all the great info about Barbie. Voted up, awesome, beautiful! I don't have any displayed in my living room, but I do think that as a conversation piece, it can't be beat. Thanks for stopping by! Now I know that here are so many people who love Barbie dolls. Barbie furniture would be an interesting conversation piece to have in a living room. Thanks, Brainy! This hub touches home for me too. Wow. All I can say is wow. This is a fantastic hub, and brings back great memories. I had a friend in high school who had the original dream house (the cardboard one), so even though my house was bigger, she had me beat.